So, the year 2015 is almost at its end. While I write this, I am already in my second week of my two week time off. And boy,I really needed this two week break. 2015 was an extremely busy year for me, and I can actually cut the year in half. At the first half, I was still busy participating in a project where I designed and deployed System Center 2012 R2 Configuration Manager. I also built a stand-alone Image Building environment running MDT 2013. Unfortunately, the project took way longer than expected due the customer being unable to take ownership and start administering it by themselves. Eventually I decided to walk away after the contractual end date of my involvement despite the fact the project isn’t finished yet. The longer it took, the more frustrating the project became for me so the decision to walk away was eventually the right one. This takes me to the second half. In the second half, I saw a dramatic shift in my job since I did only one Configuration Manager design and deployment in the second half of 2015. I started to extend my skillset on Enterprise Client Management a bit more with Microsoft Intune and Microsoft’s Public Cloud platform: Azure. I also started to deliver more workshops, master classes and training sessions. This is something I really like to do and I want to thank those who made it possible for me. It allowed to me renew my Microsoft Certified Trainer certification. Fortunately, the frustrations of the first half provided some learning moments which required me to become a more complete consultant. So my coworker arranged a two day training session for me called “Professional Recommending” (this may be a poor translation of Professioneel Adviseren in Dutch) provided by Yearth. This is by far the most important training I received in my career and it really started to pay off pretty quickly by receiving more positive feedback from customers. I became a more complete consultant with this training. I was also happy to do the presentation workshop with Monique Kerssens and Jinxiu Hu from Niqué Consultancy BV at ExpertsLive 2015. I was happy to receive the feedback that my presentation skills have developed greatly. To quote them: “you’re standing like a house”. The icing on the cake came at the end of this year when I was asked to review the DataON CiB-9224 platform. You can read the review in my previous post. So, I experienced some highs and lows this year. Fortunately, the highs came at the second half. Azure RemoteApp and App-V sequences: does it work? Last year when Azure RemoteApp was announced at a conference, I asked the speaker about support for App-V 5 sequences running on the Azure RemoteApp platform. While the speaker actually questioned my question, I wasn’t really sure if App-V sequences are supported by Microsoft. I wasn’t able to find any statement by Microsoft, this leaves me to believe it has never been tested. Recently I was asked to deliver a masterclass regarding application provisiong using Azure RemoteApp. One of the participants asked me if App-V 5 sequences could be used. One of the other trainers, Alex Sweserijnen (@AlexSweserijnen on Twitter), also started a healthy discussion with me about this feature. Since I’m more focused on application deployment than application scripting using MSI or App-V which is more Alex’ cup of tea, I am a strong believer in using App-V.
Alex had a few small App-V 5 sequences available I could use for testing. I’d like to thank Alex for delivering them so I didn’t need to create them myself. As you can see , Azure RemoteApp is perfectly happy to publish applications sequenced in App-V 5.I adde some The next question obviously is if they will actually work. So I need to test it on my client. So let’s start my Azure RemoteApp client. So here are my apps published. Let’s start PuTTY to see what happens. 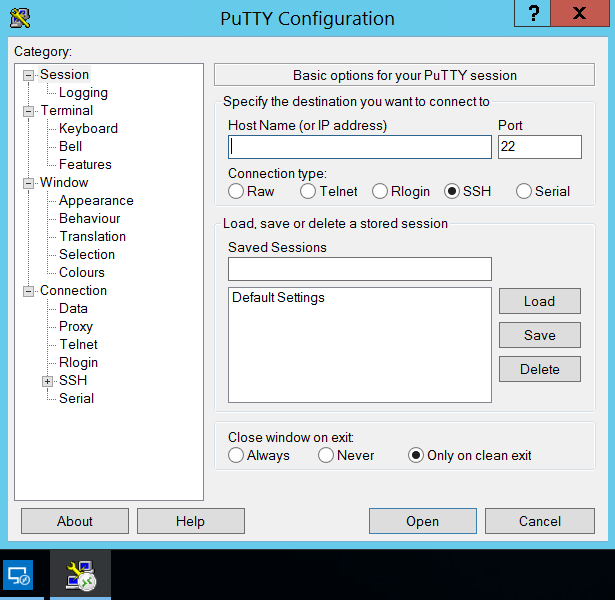 We can clearly see PuTTY is started as a RemoteApp. 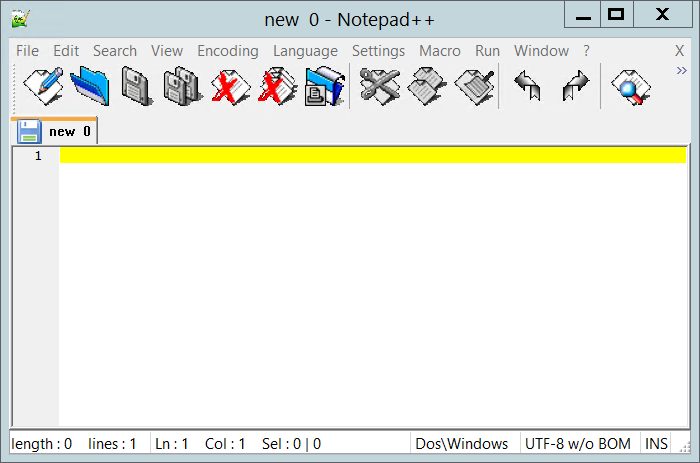 Notepad++ works fine as well. I was kind of expecting this result since I see no technical reason why this shouldn’t work in the first place. Feel free to play around with this yourself. 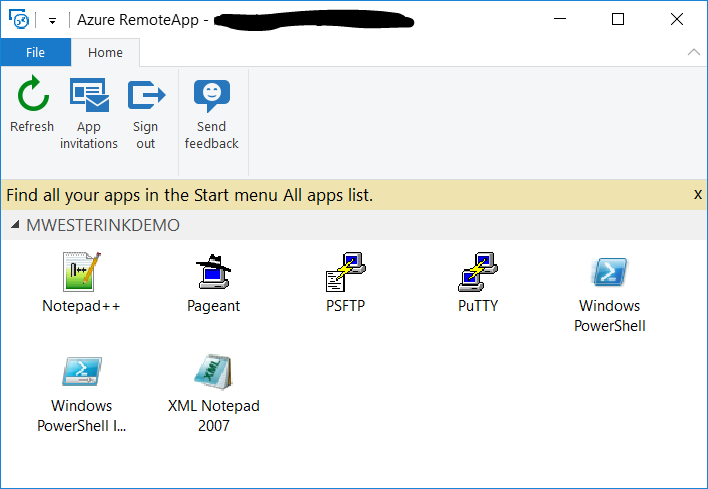 The Azure RemoteApp environment allows you to test the environment by publishing the apps to a limited set of users before publishing them to all users who need them. Building your Azure RemoteApp template images is quite a straightforward operation. You can create your image .vhd on-premises or you can use the Windows Server 2012 R2 Session Host from the Azure Gallery. The latter contains a complete script to check if all requirements are met before shutting down the VM with Sysprep (but doesn’t facilitate the requirement mentioned in this post). Unfortunately, one requirement is missing which will cause the image upload process to fail. Before creating a generalized .vhd with Sysprep the file %SYSTEMDRIVE%\Windows\Panther\unattend.xml needs to be removed. You can see in the Upload-AzureRemoteAppTemplateImage.ps1 file downloaded from Azure that the presence of this file is checked before the actual upload.